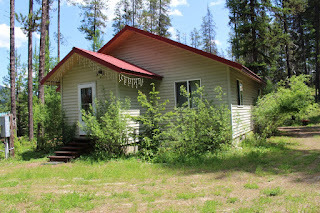 Great little getaway for sale located in Haugan, Montana. The charming home is near the Lincoln Silver Dollar and the snowmobile capital! You can ride your ATV or snowmobile from your front door to over 1000 miles of groomed trails. Hunting, fishing, and riding trails are all walking distance from this property! Make this your residence or your weekend place. The estate has 2 bedrooms, 1 bathroom and extra land for a large shop! There is even room for family RV parking! Enjoy the abundant wildlife and mountain views. Located 15 minutes from Lookout Pass and the Hiawatha bike trail. You must see this Western Montana property. Contact Judy Stang to schedule your showing today at 406-822-2316. Priced at $169,000.